In October, I joined some members of the OFN Financial Services team (Lisa Wright, Senior Vice President, Financial Services; and Max Gritzuk, Vice President, Financial Services;) to visit our Member, Southern Bancorp & Southern Bancorp Community Partners. The OFN team had an opportunity to meet with senior management to understand the growth strategy of the bank which includes acquisition of banks and organic growth in underserved communities in the Mississippi Delta. The highlight of the trip was a tour to various communities that Southern serves in the Delta. The team visited Southern’s Arkadelphia banking operations and met with loan customer Roger Perry, RP Detail. Southern helped Roger find and finance a location for his auto detail shop. His wife also has a salon in the facility. You have to see the video of Roger! 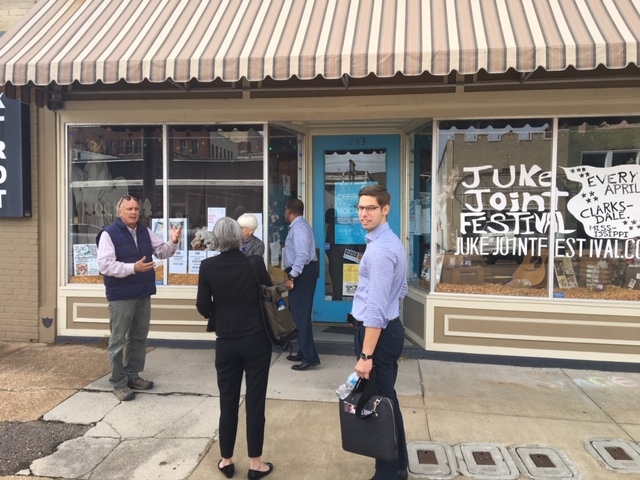 OFN also visited Clarksdale, MS. where Southern has financed several projects in Clarksdale ranging from a historic hotel, to a community center, to an artists’ cooperative. We met with Bubba O’Keefe, a long-time Southern customer who has helped lead the transformation of Clarksdale to an up and coming community attracting artists and musicians to the downtown area. Bubba gave us a tour of the region, and many projects he had financed and developed with the support of Southern. We highly recommend a visit to this town for anyone who loves music. The OFN team toured Southern alongside Justina Alders-Sheya, a passionate international impact investor from Triodos Investment Group based in the Netherlands, who manages their SFRE Fund. The fund recently made an equity investment in Southern Bancorp, their first investment in the U.S.
OFN has followed the site visit with the approval of a $1 million equity investment in Southern Bancorp, which is part of their year-long equity raise to fuel their growth strategy. Southern management has worked diligently to structure an equity investment with innovative features to attract a range of impact investors.